Click here to read Tanyetta's mommy blog: "Days Like These" which shares her experience during the Kodak photo expo at 30 Minute Photos Etc. 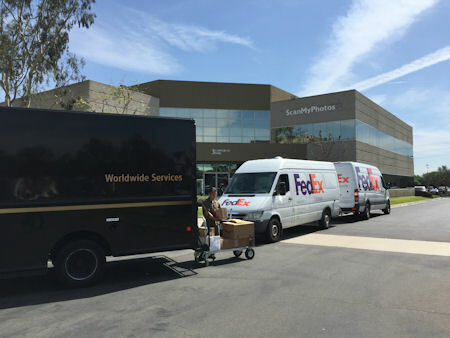 and ScanMyPhotos.com in Irvine, CA. Hello Everyone! A great group of mommy bloggers were invited to attend the: VIP Mommy Blogger-Kodak Experience Expo in Irvine, CA Hosted by: Mitch Goldstone, President of ScanMyPhotos International, Jacqueline A. Mangione, PR Manager of Eastman Kodak Company. I was in that lucky number! How cool was that? Upon arrival, I should have known this was going to be a truly exciting event. The staff greeted us with Mimosas (I had sparkling water) and the best part, they had a birthday cake for me there! How AWESOME was that? The goodies (scanners, printers, digital cameras and more) you see behind me were the special presents that were given out to the mommy bloggers that were fortunate enough to attend this awesome event. Lunch (provided by Panera) was delicious. My first time having their food and I have to say, I'll visit them again at a later date. Their sandwiches are YUM! After lunch and mingling, it was time to get down to business. With the assistance of Shannon and Cesar the very knowledgeable technical support staff, each mommy blogger chose different methods of creating our memories. beautifully, I couldn't resist creating a few prints to replace the old and tattered photo. Their theme of the day was: Make it Brilliant, Make Something Kodak and we were able to do just that. I was quite impressed with the ease of the use of the Kodak Kiosks. The steps included inserting your media card, usb or whatever device you have to upload your photos. The touch screen glides you through the process in a matter of minutes, you've created memories that will last a lifetime. At the close of a very exciting day, we each received goodies which included gift cards and more! A special thank you to Mitch Goldstone, President of ScanMyPhotos International, Jacqueline A. Mangione PR Manager of Eastman Kodak Company for hosting this amazing event. Thank you for the opportunity to attend this very informative and user friendly event. If you're like me, you have a zillion photos on your computer, camera SM cards, boxes of photos and more. I'd like to suggest you take the time to create some memories of your own. 'Gather your photos, upload them to a Kodak Kiosk or from the comfort of your own home, create photo books, collages and more all with the click or touch of the screen. "Preserving Memories in an Instant"-That's what Kodak is all about! The Onion Parodies Photo Services With "Netpix"